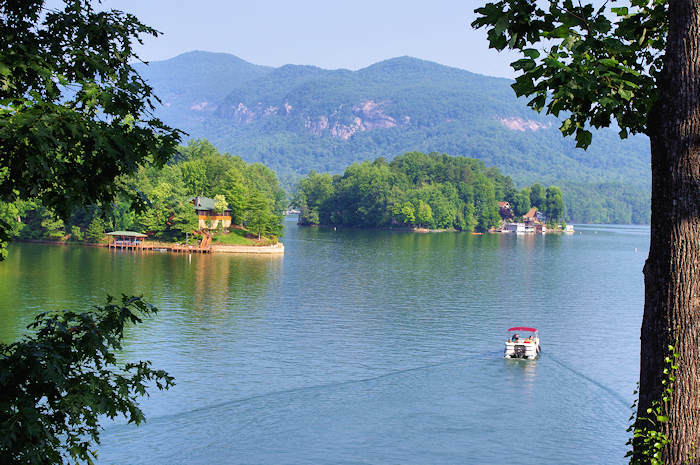 Gorgeous Fontana Lake is the largest lake in Western North Carolina, surrounded by the Great Smoky Mountains. 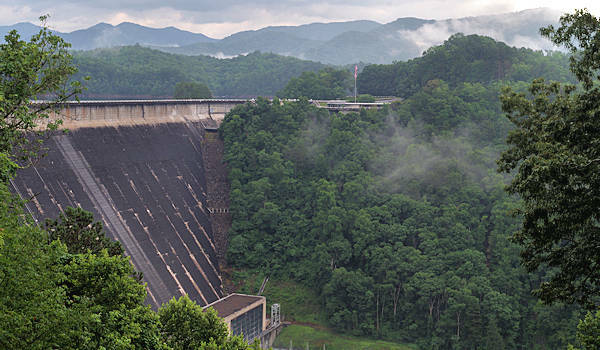 The 480-ft. tall Fontana Dam is the highest dam east of the Rockies (the equivalent of a 50-story skyscraper). Walk or drive across the dam and learn about the construction during the 1940s in the Tennessee Valley Authority Visitor Center. The Appalachian Trail, which extends from Georgia to Maine, crosses Fontana Dam. 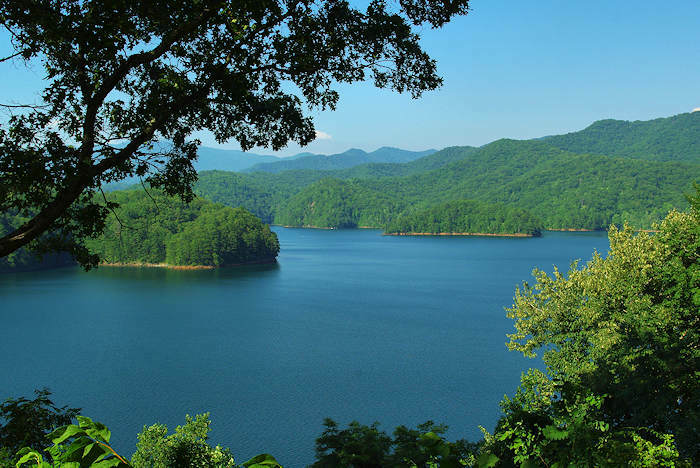 The Great Smoky Mountains National Park and Nantahala National Forest own and protect about 90% of the 238-mile shoreline. 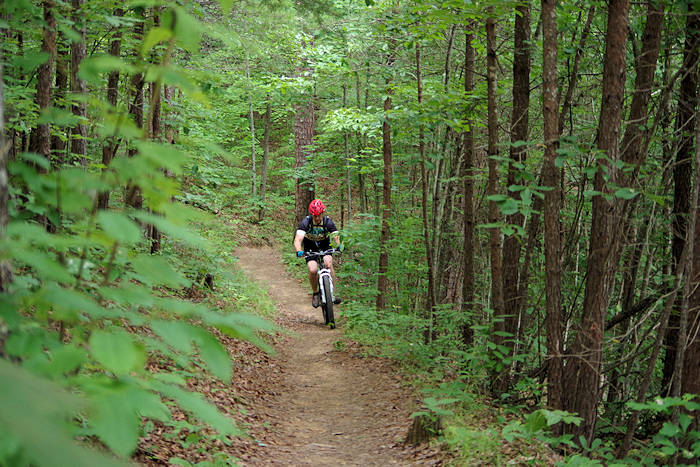 The drive via the Indian Lakes Scenic Byway (NC Highway 28 from Almond) has several overlooks along the way. Fishing, boating and swimming are all popular at Fontana, but it is perhaps most appreciated by wilderness hikers and campers. 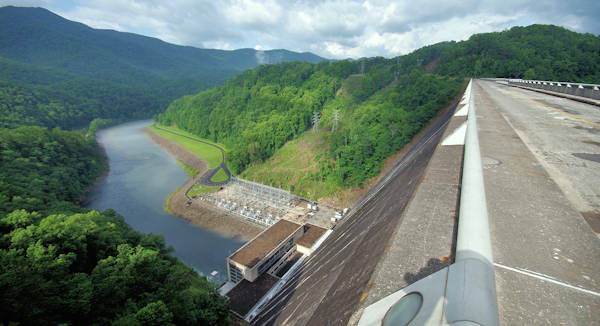 The Fontana Dam Visitor Center is open to the public from 9 AM to 7 PM daily from May through November. But you can drive or walk across the dam all year for spectacular panoramic views. The dam was featured in the 2015 film "A Walk in the Woods." Read more! In addition to the Visitor Center parking, there are two other parking areas with overlooks. One is across the bridge, driving the road to the end for the view in the photo above. Just before the Visitor Center on the opposite side of the road is a parking area with picnic pavilion, pier and an overlook with this view of the lake. Fontana was built during World War II to provide electric power for the war effort. A new town, housing some 5,000 people who worked around the clock in three shifts sprang up in the forest, and the project broke construction records. What was once the construction village is now Fontana Village Resort, a year-round resort with a big variety of accommodations including a lodge, cabins and camping. Also find a general store, restaurants, marina and outdoor pools. 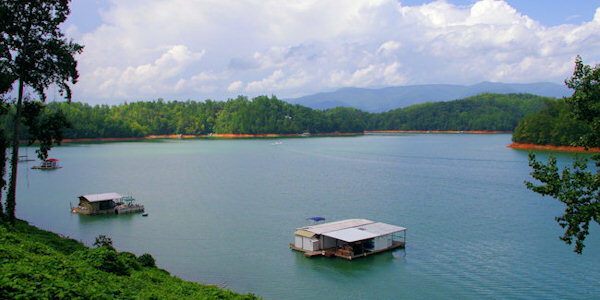 There are about 400 houseboats on Fontana Lake, and many are vacation rentals. 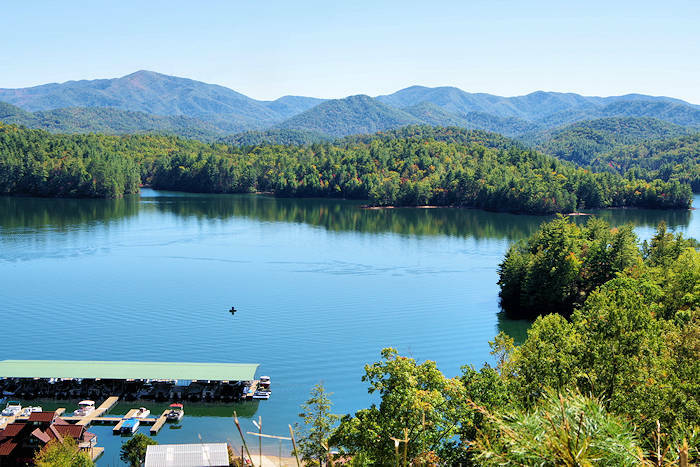 With a boat, you can reach many remote sections of the Great Smoky Mountains. 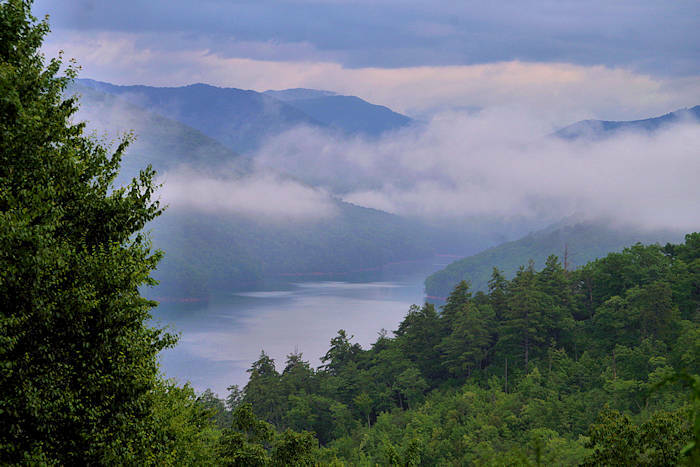 In addition to the Appalachian Trail, the Lakeshore Trail starts across the dam (take the road to the right) and goes 35 miles to the Road to Nowhere near Bryson City. 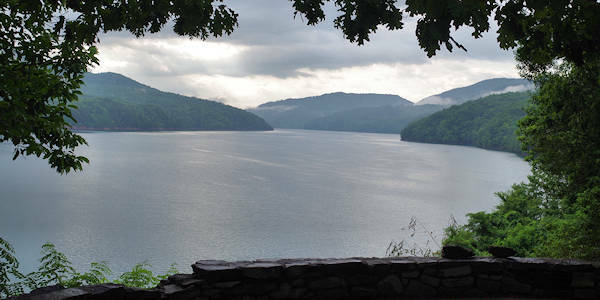 The dam is a popular stop for hikers on the Appalachian Trail, since hot showers are available at the trail shelter, earning the name "Fontana Hilton." Directions from Asheville (94 miles): Take I-40 West. Take the exit for Hwy 74 (Great Smoky Mountain Expressway). Stay on Hwy 74 (four lanes) you will pass Clyde and Sylva, and 8 miles past Bryson City (last chance for groceries and restaurants) turn right on Hwy 28. Continue on Hwy 28 for 25 miles (stop at the Stecoah Arts Center on your way!). 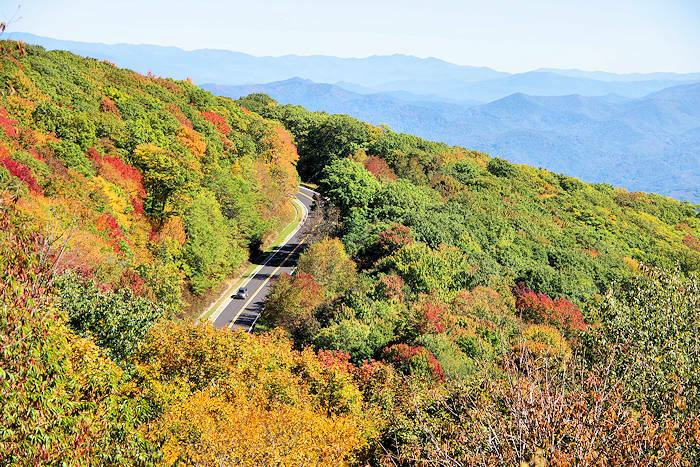 Continue past the dam via NC Highway and US Highway 129 to reach The Dragon scenic drive, Yellow Creek Falls and Lake Santeetlah.